It was no surprise when Berkley and Peter walked through our doors that Keswick Vineyards was the perfect place for their vineyard wedding. It was also no surprise that there was one key detail that would tie this wedding (and in turn this couple) together. What is that? The Navy. 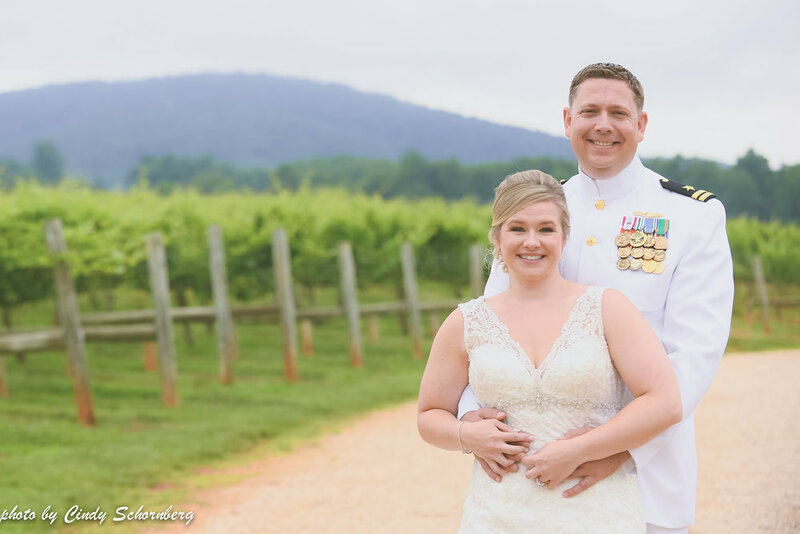 Lieutenant Peter Maki married the love of his life Berkley here at Keswick Vineyards on July 3rd. They were our second couple to get married over the 4th of July holiday weekend. The timing of their vineyard wedding couldn’t have been better, with them naturally loving everything surrounding the good US of A and everything that fit within red, white, and blue realm. 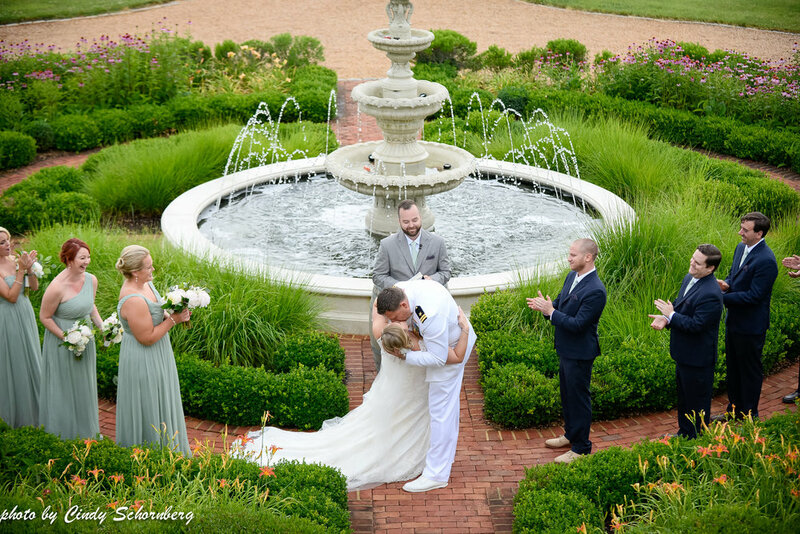 The military presence was very apparent in many aspects of their wedding, from their guests high ranks in multiple divisions of our armed services, to patriotic corn hole boards, a service dog, and the traditional sword arch initiation of the newly wedded Mr. and Mrs. In honor of the Navy, white were a must for Peter. He proudly wore his whites as he stood at the fountain waiting to finally make Berkley a Maki. They sealed an engraved box containing three different Keswick Vineyards wines, all of which are meant to age perfectly (just like their love) throughout the years. For their 1st, 5th, and 10th anniversary they’ll open the box and read their vows in remembrance of the day they said “I do”. 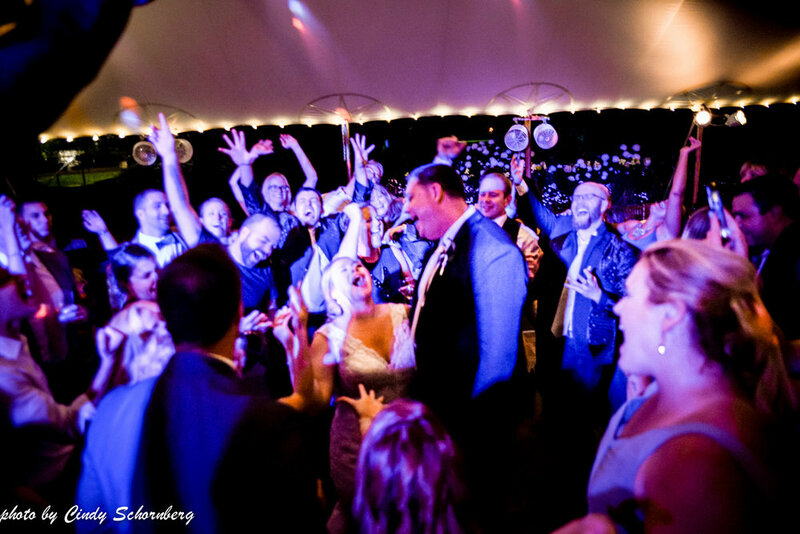 When it came time to the reception, that’s when the fun started! We knew the military would know how to party, but we underestimated their moves on the dance floor! T.D. Layman kept them on the dance floor all night and everyone had an awesome time. When couples would break away from the dance floor they had a bourbon and cigar bar to enjoy in the gazebo…the perfect late night treat. Speaking of treats, what’s a Navy wedding without the infamous sword cake cutting?! For anyone else who witnessed this event, we all know to leave the sword play to Peter. Huge thanks to the following vendors for making their Charlottesville wedding so wonderful! Day of coordinator, Keswick Vineyards. Catering, Exchange Events. Photography, April Bennett Photography. Florist, Ginger & Blooms. Hair & Makeup, The Spot Beauty Shop. Desserts, Sweethaus. Rentals, MS Events. DJ, T.D. Layman with Sound Enforcement DJ Service. Transportation, Albemarle Limousine and Blue Ridge Tours. Lighting, Skyline Tent Company and The AV Company. Officiant, Matt Goodrich.